Ever wonder why things that seem easy for others feel so difficult to you? I’m explaining a few things about this issue and answering questions about storing dress up clothes and working homework and folder-checking into your family’s routine. I wanted to comment at various times, but will leave it at this: those of us who find it “easy” to do the dishes every day are not that way because we don’t realize that it’s an option to put them off. In my case, I realized many years ago that it was easier to do them after every meal than it it to face the overwhelm of dealing with two or three days of dishes. In other words, we’re you. We just got to that realization years before you did. In my case, Mom used me as her housekeeper. She had White glove standards and really cracked the whip. Not a complaint, just an explanation. I had lots of housekeeping experience before I graduated high school, and I rebelled for a few years after that. The early experience and the later rebellion both worked for me to help me figure out which systems I could live with in my own house. One thing she went overboard on was decluttering. We weren’t allowed to keep things, usually. For many years after I became an adult, I overcompensated on that score, and eventually had to figure out for myself how much was enough. That’s been tough, and has only recently been coming together for me. 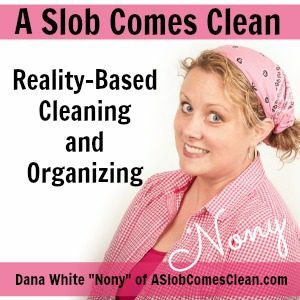 I still find decluttering and systems challenging, because although I now keep a pretty minimalist house, and it’s reasonably clean, my dirty secret is that I don’t like cleaning and I fight it on a basic level all the time. Your blog and podcasts help me figure out what works, and which priorities I’m willing to set.